Product Overview It's time your music had an upgrade. 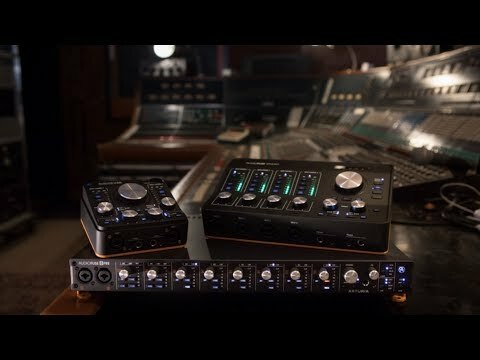 The ultimate desktop audio interface, AudioFuse Studio combines unparalleled versatility with 4 world-class preamps, incredible connectivity, and a host of clever design features. A future-proof investment in your music, and one that will let you hear, record, and mix with clarity and quality you've never heard before. No matter what studio situation you find yourself in, AudioFuse Studio is the solution. AudioFuse Studio gives you 4 of our legendary Discrete Pro© preamps to track your music, and a superb analog signal path that will reveal every nuance of your audio. The super-low Equivalent Input Noise (EIN) lets you capture every subtle detail, while the huge 72dB input gain gives you enough gain to drive even the quietest ribbon mic. Everything is also capture with a practically perfect flat frequency response, too. The quantity and quality of AudioFuse Studio's connections have to be seen to be believed. 4 Discrete Pro inputs, 4 line outputs, 4 analog insert points, ADAT I/O, SPDIF I/O, Word Clock, USB-C and MIDI. Oh, and a 3-port USB hub, because you can never have too many USB slots! Au-dioFuse Studio keeps everything in one place, with refined workflow and one-button one-function controls, so you can stay creative and focus on what matters: your music. This exciting interface sports a Bluetooth receiver with the highest possible codec, so you can pair it with your phone and stream music to your studio speakers, or track directly from the in-coming stream. Easily check your mix on multiple monitor systems with instant speaker A/B switching. AudioFuse Studio also features a dedicated Reamping output, so you can record your guitar and bass directly into your DAW, and then tweak later with precisely matched guitar-level output. It even comes with a sleek cover to keep it free from dust and scratches.